1950(? ), Roger Noble Burnham. Original monument, made of white marble, stood at the Wadsworth Hospital Center, West LA. It was destroyed during the 1971 earthquake. The monument was recreated by David Wilkins in 1973 in concrete and plaster, and is located at Wilshire and Veteran. Text from plaque: "1898 - To Those Who Volunteered and Extended the Hand of Liberty to Alien Peoples - 1902. 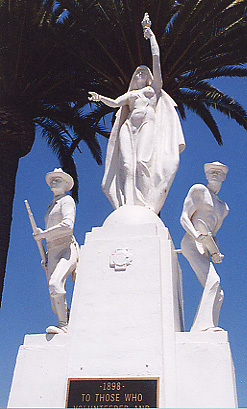 Erected 1950 by United Spanish War Veterans. Louis Leonard McClary Chairman; Roger Noble Burnham Sculpture."